Gov. 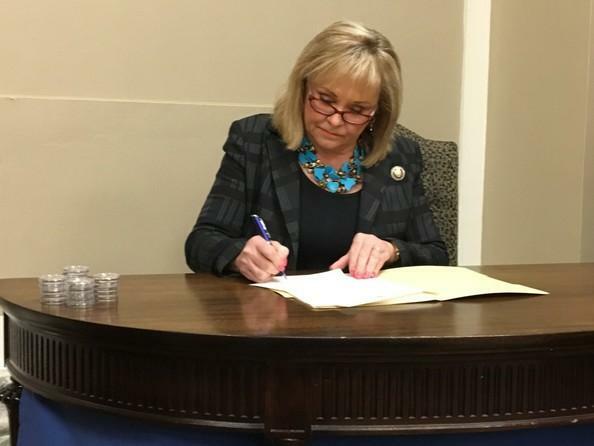 Mary Fallin approved commutations Wednesday for 21 people in prison for crimes with reduced or no prison sentences after the passage of State Question 780. Work to get commutations for 23 people in prison for nonviolent crimes ended Wednesday with 21 getting final approval from Gov. Mary Fallin. "Based on the will of the voters of Oklahoma and the legislators, plus my thorough review of all these cases, I cannot think of … a reason why they should remain in our prison system. They will be out today," Fallin said. They were all serving 10 years or more for crimes that carry much shorter sentences or no prison time at all since voters reclassified several drug and property crimes through State Question 780. Oklahomans for Criminal Justice Reform helped them apply for commutations through Project Commutation, which the group launched in May with the group FWD.us. "These people were sentenced to a cumulative total of 349 years in prison, but today we are shaving off 306 years in prison," Fallin said. OCJR is also helping those former inmates get addiction treatment, housing and work. Eight more go to the Pardon and Parole Board next week. OCJR board member Gene Rainbolt says the state is turning a corner. "Our most successful industry in Oklahoma has been running a felony factory, which is administered by the District Attorneys Association. I really speak to every voter in Oklahoma: We should focus on rehabilitation, not on retribution," Rainbolt said. Criminal justice reform supporters hope state lawmakers will make SQ780 retroactive next year.